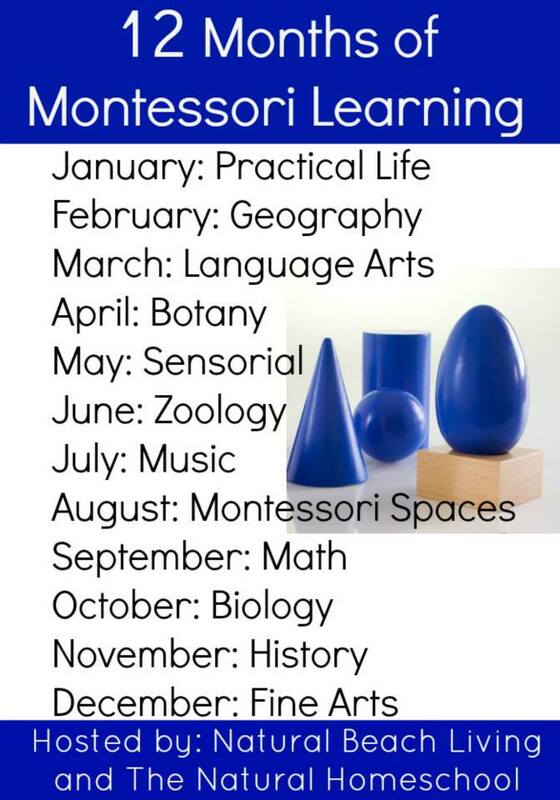 The topic for the 12 Months of Montessori Learning series this month is sensorial activities. 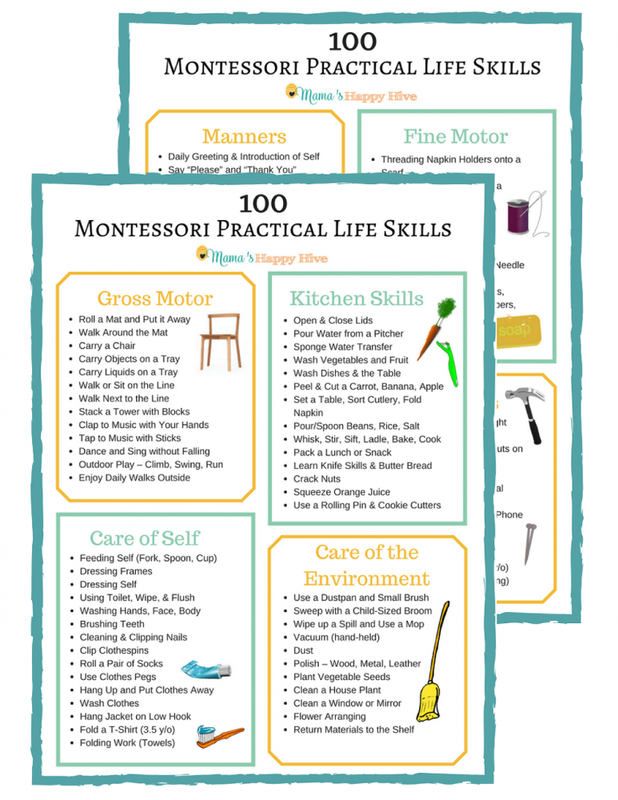 This is one of my favorite Montessori topics and I went all out on this post! 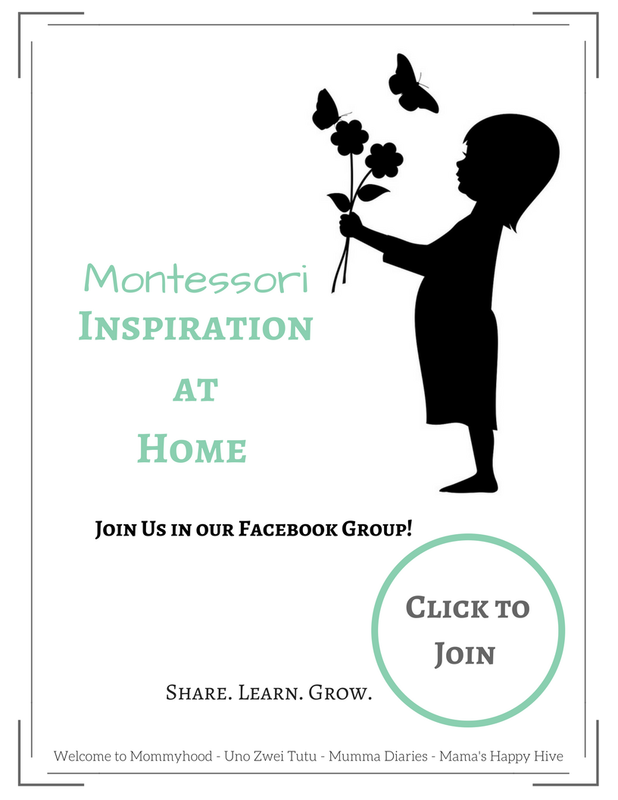 This post has it all and was written to be a resource for using Montessori inspired five senses activities. I hope you will find inspiration within this post for playing and learning. 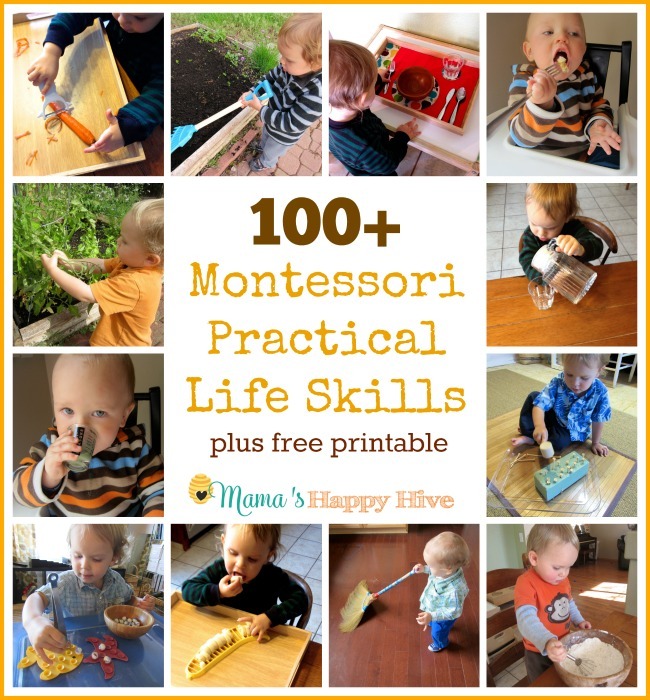 There is also an awesome giveaway for Montessori Services at the end of this post! Please scroll all the way to the end and enter to win. Throughout this post you will find pictures of these beautiful "The Five Senses" Book Set from Montessori Services. I used the ideas from the books as inspiration for the activities in this post. Each book has an introduction about each sense, describes briefly 2-3 parts of the body that are used for each sense, and then it explains several ways we use our senses. These books give great attention to detail - they concentrate on teaching a toddler opposites, about people who may have a disability related to that sense, and the precautions to take to protect our senses. Several examples include: the tactile sense of hot versus cold and the auditory sense of loud versus quiet. Also, it explains when to use eye or ear protection. 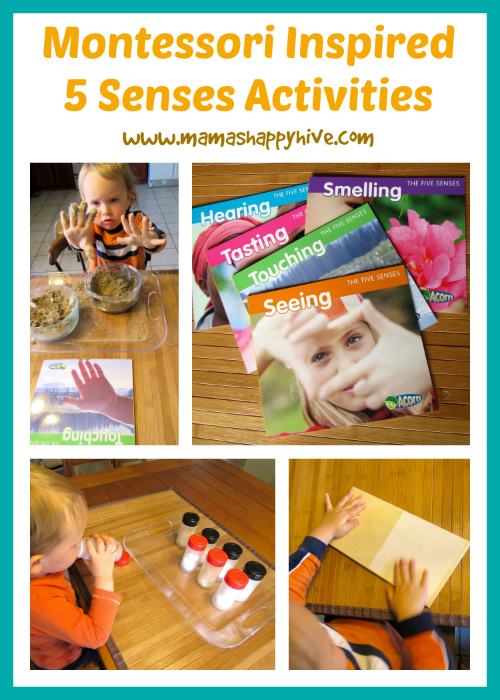 These books are a wonderful resource for children to learn about the five senses. 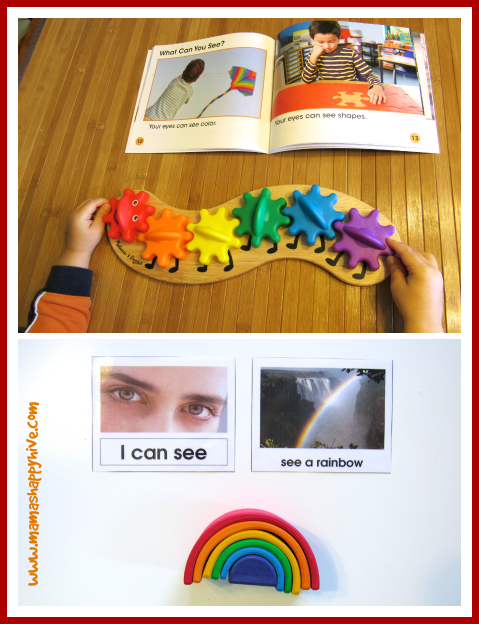 A great place to start learning about the five senses is with the visual sense. The visual sense is our dominant sense that most of us utilize everyday. 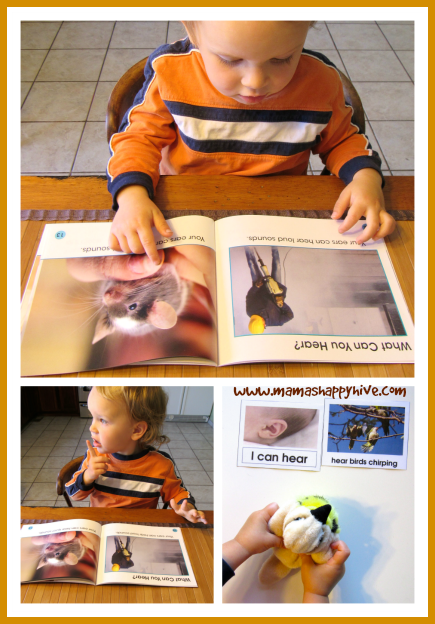 Little Bee enjoyed looking at the bright pictures in our "Seeing" book from "The Five Senses" Book Set. I explained to him that we can see colors and shapes. Little Bee practiced using his visual sense by playing with these two rainbow toys - Melissa & Doug Caterpillar Gear Toy and Grimm's Small Rainbow Nesting Wooden Block Stacker. 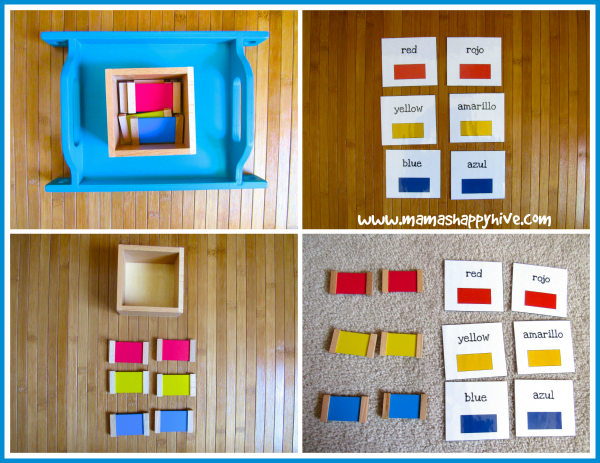 Also, a wonderful Montessori activity for learning colors is using the color tablets. Please visit our, Montessori Inspired Toddler Rainbow Unit for more information on learning the colors of the rainbow using the color tablets. 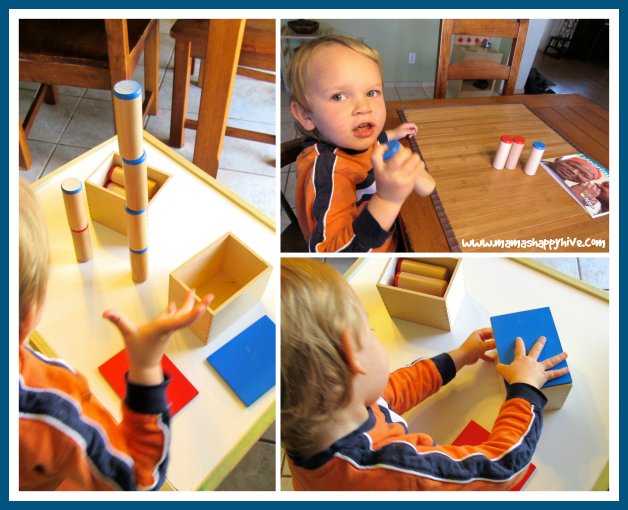 *The Toddler Five Senses Book printables featured in this post are from the Montessori Print Shop. The Montessori Primary Guide writes a wonderful tutorial for using the color tablets. 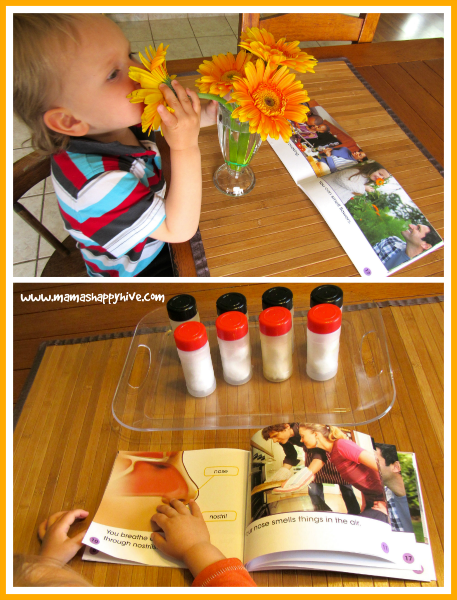 In the "Touching" tactile sense book, I was inspired to set up a sensorial "hot & cold" experience for Little Bee. 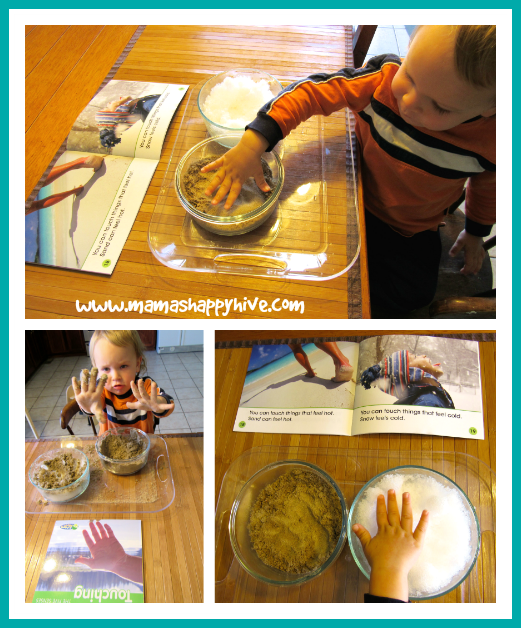 The book has a couple pages that explain the sensation of hot sand and cold snow. We had a late spring snow storm and that presented the perfect opportunity for me to gather a bowl full of snow. I also gathered some play sand from the sandbox and heated it up in a skillet. Little Bee loved this activity and it kept him occupied for half an hour. Eventually he mixed the sand into the snow and it was time to clean up. The next activity that we did for the tactile sense was exploring the Montessori Touch Boards. 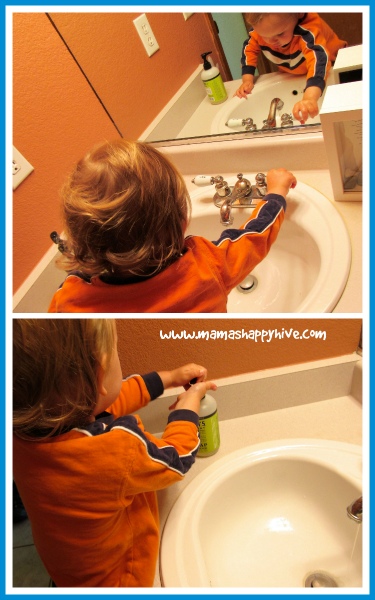 To prepare Little Bee for this activity, I had him "sensitize his fingertips" by washing his hands. Then we proceeded to experience the Montessori Touch Boards. 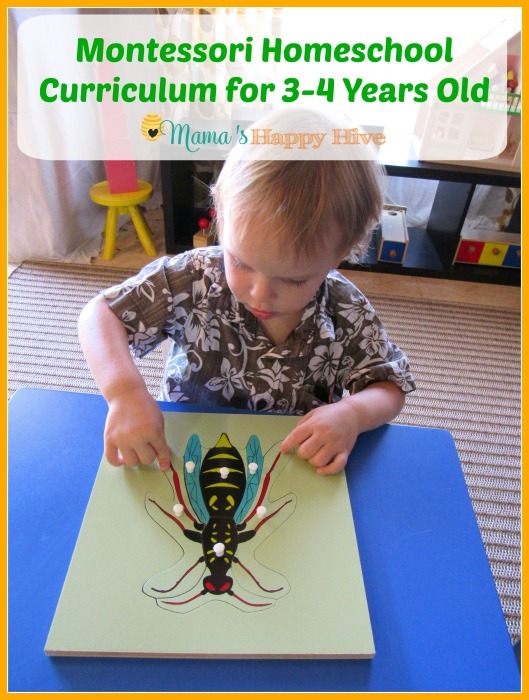 I only presented the first board to Little Bee as he is only 27 months old. He is not ready for the other boards yet. Honestly, he wasn't very interested in the first board. He touched it a few times and then he was ready to move on. So we will come back to this activity when he is older. 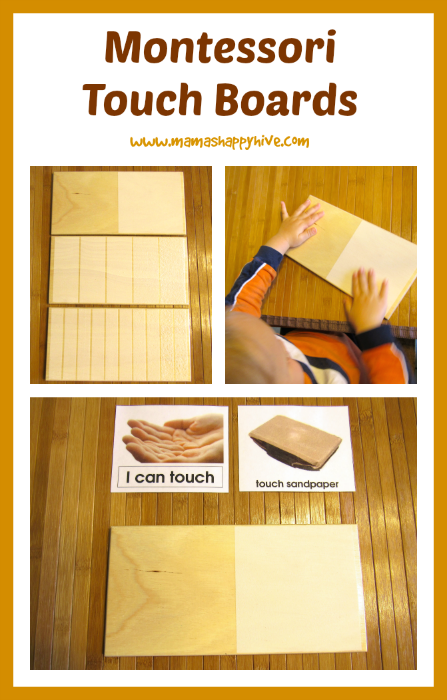 For a wonderful tutorial, please visit the Montessori Primary Guide - Tactile Sense: Touch Boards. Little Bee explored the "Smelling" book and enjoyed sniffing a flower. We talked about how we smell through our noses and the two little holes in our nose are called nostrils (illustrations are in the book). After our introduction to the sense of smell, I set up DIY Montessori smelling jars for Little Bee to enjoy. To make these Montessori smelling jars, I saved several plastic spice/herb containers from my spice drawer. I washed each jar out with bleach water to help take the smell out of the bottles. I collected four black lids and four red lids to create matching pairs for sniffing. I filled each jar up with two cotton balls and 10-12 drops of essential oils. Each matching pair had the following smells: lavender, lemon, oregano, and peppermint. Little Bee absolutely loved this activity. 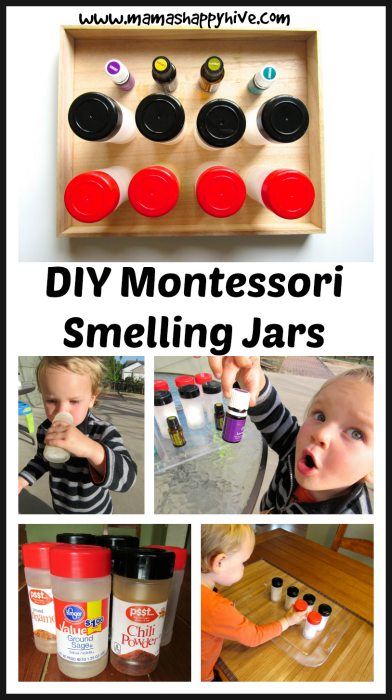 To read a detailed outline of how to present the smelling jars, please visit - Montessori Primary Guide - Olfactory Sense: Smelling Jars. One of the most interesting of the five senses to explore was the sense of taste. The tasting book has bright colorful pictures of children tasting different flavors. I set up a tray with the four basic flavors for Little Bee to taste. 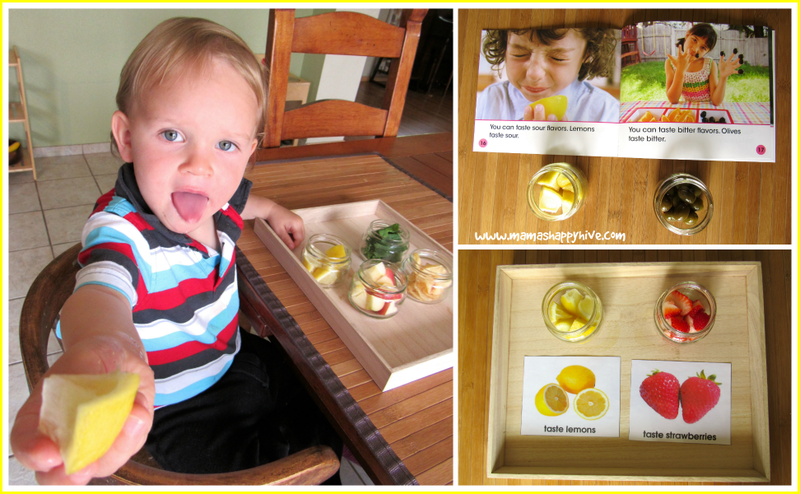 He tasted lemons (sour), raw kale or olives (bitter), potato chips (salty), and strawberries or apples (sweet.) The tasting book also points out a fifth taste that has become widely recognized called, Umami. This taste incorporates all the flavors and is usually associated with the taste of meat. Vegetarian sources of the Umami flavor can also be found in tomatoes, soy beans, potatoes, mushrooms, sweat potatoes, and carrots. To learn more about the Umami taste, please visit - History of Umami. After tasting the fun food flavors, I assembled eight DIY Montessori Tasting Bottles for Little Bee to explore. I bought four blue bottles and four brown bottles from Amazon to make matching pairs for tasting the four basic flavors - sour, sweet, bitter, and salty. A beautiful set of tasting bottles with wooden tray can also be found on Montessori Services. 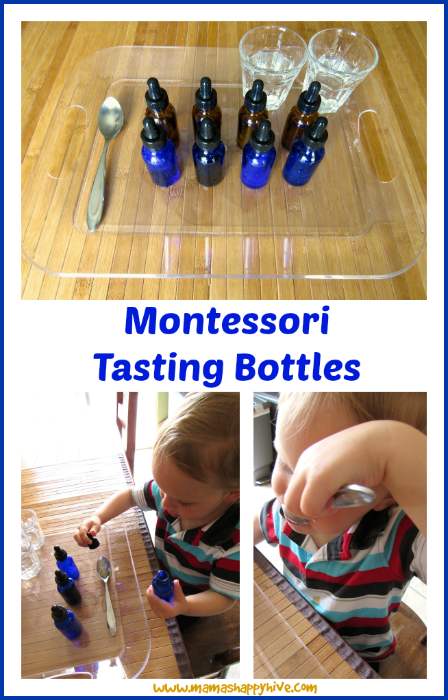 I followed the instructions for the tasting bottle presentation from the Montessori Primary Guide - Gustatory Sense: Tasting Bottles. It was fun reading through the auditory sense book and imitating the sounds displayed in the bright pictures on each page. I made a loud exaggerated sound for the jack hammer and a very quiet whispered sound for the mouse. Little Bee repeated the sounds back to me and put his finger to his lips for the very quiet mouse sound. This was a wonderful opportunity to learn about opposites. Next, we took out our sound boxes and Little Bee enjoyed shaking them to hear the various sounds. He's not completely ready at 27 months to use the sound boxes properly. He did have a lot of fun stacking them into a tower, shaking them, and then color coordinating them into their correct boxes. To simplify this activity for Little Bee, I picked out the loudest matching pair (beans) and the softest matching pair (sand.) Little Bee was able to match these two very opposite sounds easily. To learn how to present the sound boxes to your child (3-6 years old), please visit - Montessori Primary Guide - Auditory Sense: Sound Boxes. 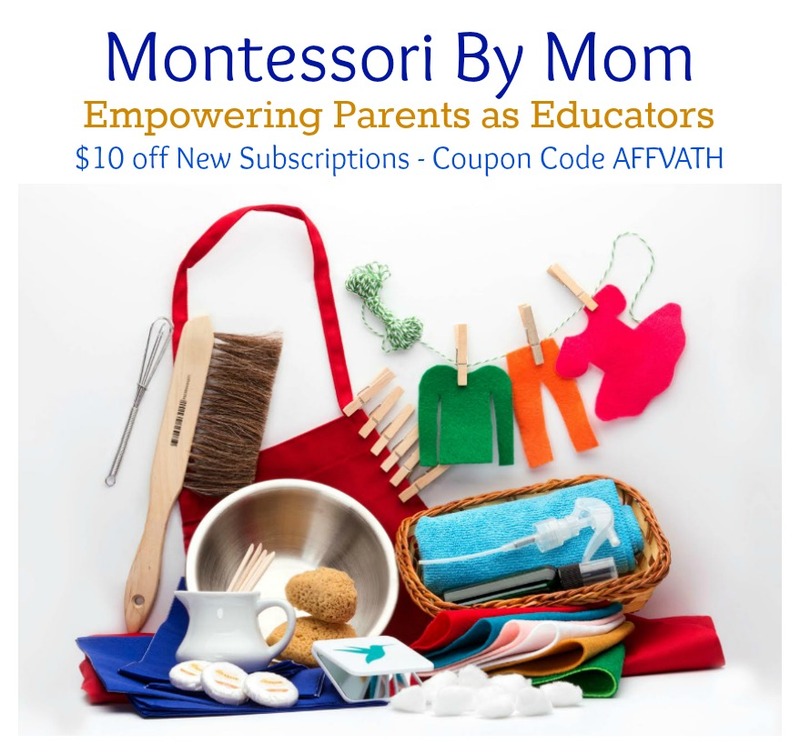 Please enter this amazing giveaway for a $50 dollar gift certificate to Montessori Services! 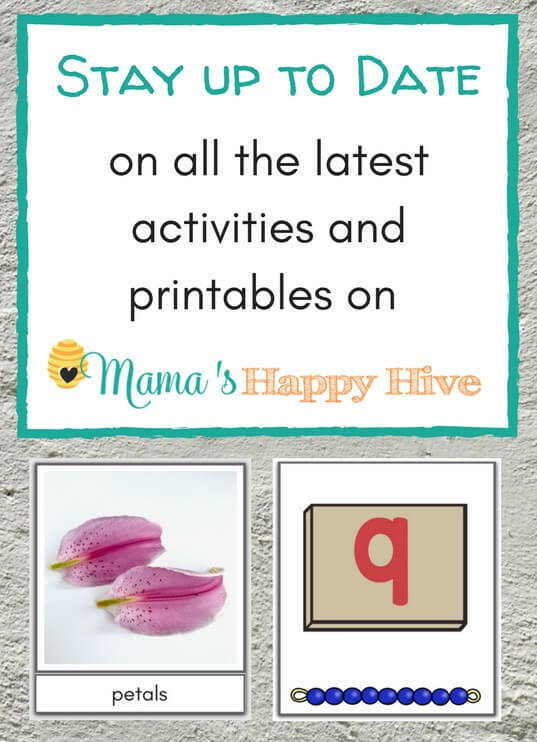 I love how beautifully set up your activities are! For the 5 senses, I couldn’t get my 3 year old to understand the concept especially sound and smell. We’ll keep trying, especially using some of your ideas above. Thanks for sharing! 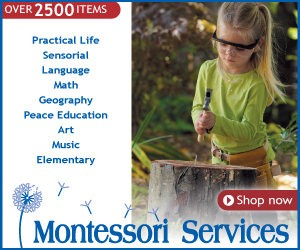 I’ve always wanted to buy a hand drill from Montessori Services, so I will buy this if I win! I adore your setup for each sense. It is gorgeous and inspiring. And now I want a set of those books as well. 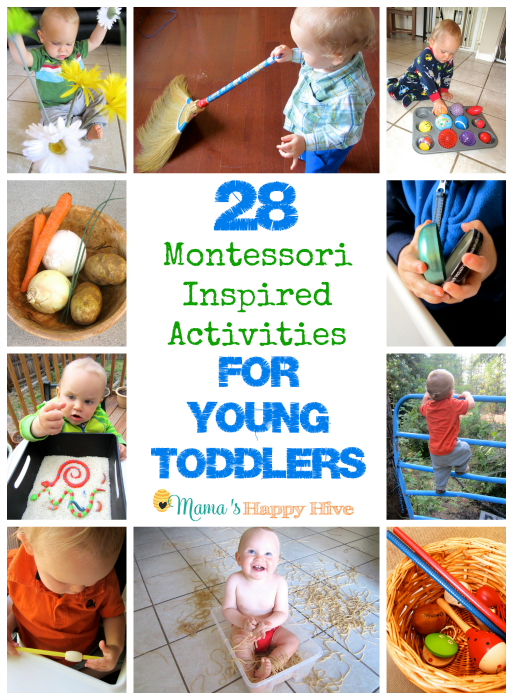 Such a wonderful collection of activities! We have those books in the library and totally love it! Thanks for sharing! Little B is soo cute in the pictures!! 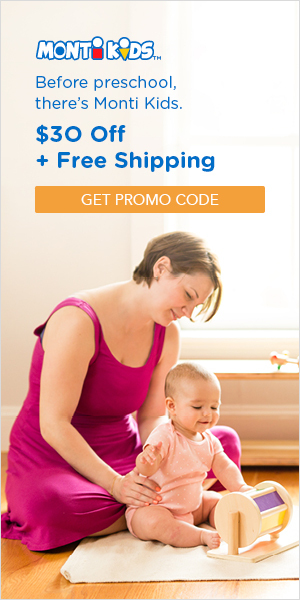 I’d love to win so I could get my kids lots of practical life cleaning supplies. We would love the $50 gift card to purchase the Roman Arch set! Thank you for this wonderful post of ideas. 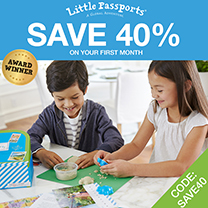 I would love to buy some sandpaper letters for my preschool-aged son. 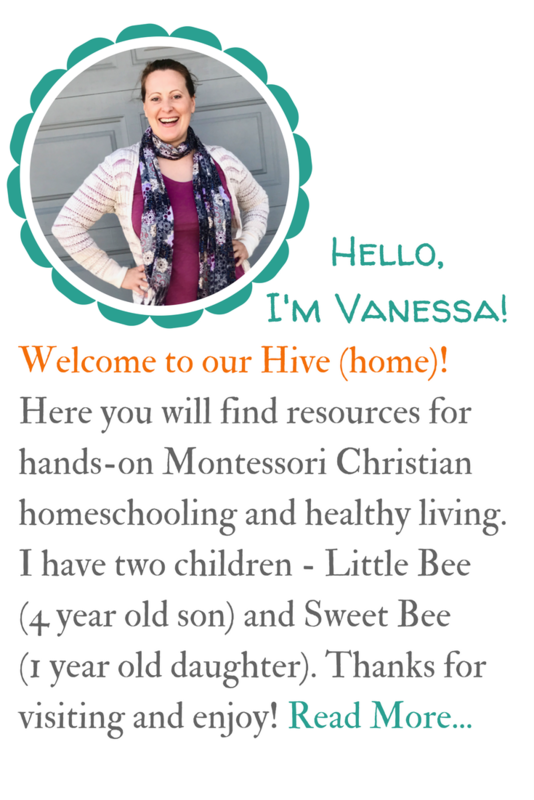 Thank you so much for including us in this amazing collection of resources!